Grab yourself a cuppa, this is a long update! LOL! No photos either as my mouse on my computer needs new batteries. Ok, so March 31st saw us take our trip down to Jamberoo. All the hotels were booked out so we drove down there and back in the one day. All the way down Kate kept singing (and got Luke in on it too) 'Jamberoo where you can troll the action'. So cute! ROFL! How much fun was Jamberoo?!?!? We all had a ball! It was great as we didnt have to wait any longer than about 5 minutes for any one ride. Now, I always knew Luke was a little bit of a daredevil, but I guess I just didnt realise how much. GGGRRRR The photo wont upload! <-----He went on this ride all by himself. Twice. He beat Steve and Justin the first time, but second time things went a bit strange and he was facing the wrong way at one stage! ROFL! He still loved it though! Both the kids LOVED the luge!!! It was fun, except when you get stuck behind slowpokes who are scared! The pools were a little cold, but do you think that stopped my two? No siree! They were in the thick of things all day long! We really did have a wonderful family day out and lets just say we slept well that night! Just before Easter we tried for a home loan. The amounts of money they are willing to give you is rediculous! There was no way we could repay what they were willing to offer us and because we didnt want to have the bank foreclose on the loan we went for a sensible amount! We got it! We found out the day before Good Friday so it made it one awesome friday! Then Kate went to my grandparents house for a couple of days. I was devastated when I returned. You see, about a month or so ago I bought a canary. I always wanted one growing up. So I bought myself one. When I got home, Meggs (our cat) had knocked the cage over and eaten the bird. The feathers in the house speak for themselves. The cat was close to extinction, but I forgave its 'natural instinct'. He is sporting a spiffy new collar with a bell now though, he hates it and is always trying to get it off! Serves him right! Then on the weekend, after being mucked around a little over an offer we put in for a house, we were scouring the internet again looking at the same old houses. 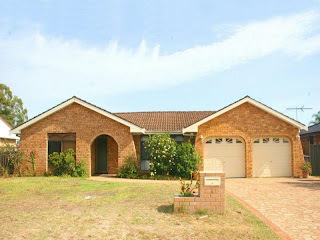 A couple of weeks ago when we first started searching we saw a house that was nice but it was listed at $380k, so we didnt bother persuing it as it was a little our of our range at $350k. Well, on saturday we saw it listed as $365k so we thought, why not lets have a look, you never know what they will take as an offer. So we went and had a look. We really liked it. We decided to put an offer in. The agent said $355k so thats was our offer. We got a phone call later that day. The house was ours!!!!! We couldnt believe it!!! It has 4 bedrooms (for the growing family ;)) plus a double garage (obviously LOL) and it has a family room, a lovely wooden kitchen with black granite benchtops, plus a ensuite, it has a study/computer area that is my new scrap area (YAY!) and it has parquetry floors even in the bedrooms, it has these wonderful french door which open onto the backyard, and 3 aircons (lucky DH like it cold! LOL!) The best part is, NOTHING, not a thing needs to be done to it! Sweet! Although it is one of the 'blander' houses on the street so it needs the gardens done I think. Now. I know it has a square window. It annoys me to no end. DH has decided to grow a big jacaranda tree in the front yard to hide it! Now my biggest decision is whether to move Kate's school? It is only the next suburb away. Not sure. Still deciding. I am 12 weeks and 3 days pregnant today. I had an ultrasound last week, the nuchal translucency one. All is well and it was so cute to see the little peanut! I am keeping well. I am still sick, not as much and not all day (which is a blessing)! I even did a 8 1/2 hour shift standing up on friday and didnt complain once (although I felt like it! LOL! ;)) The tiredness still remains, but working nights will do that to you anyway I guess. Yesterday we went tp Plumpton Park to feed the ducks. We had a ball and the kids ran about and laughed and yelled and had fun. The ducks did not want out bread. The fish did though so at least it wasnt wasted! ;) I was going to take the video camera and I wish I did as Luke was saying the funniest things! There was this duck there and he points at it and calls out "mum, its a chicken duck" and sure enough it looked like a chicken! ROFL! But I did take my camera so hopefully I have some good shots of them. I received the new SM today, it has the Masters 2007 details in it. Guess what? NO BTP! Yes I am spewing but I am still going to do my project as I love the idea of what I am going to do. I guess I can share that now huh? I bought an old wooden ladder off ebay. I cut it so I had 5 rungs (it was like 8ft long and wouldnt fit in my car anyway! ROFL!) and I bought 4 canvases. I am going to make a frame with it so that I have a canvas between each rung. It is going to look wonderful once it is all stained and the canvases are done. I am going to wait until my belly pops a bit more for the photos so all 5 of us will be in it. ;) So it will be a long time coming but essentially, that is it. Well, thats about it from me today. I know, one heck of a long post, but if I dont get it down I will forget it all!!! I better go as I have to have a shower and get ready for work and eat dinner all in about 35 minutes. Easy peasy, but getting the kids in from the front yard may prove a little harder! LOL! They love playing in the front yard but we get a few cars up and down the street and I am constantly looking out the window and door at them to make sure they are ok.
Glad that you are feeling better, I hope the tiredness eases up soon. That house is beautiful. Congratulations to the new home owners. Yay on the house Beth..woohoo for you guys. Love the look of that big slide..oh what fun it is to slide lol. I love the idea of your btp too, what a shame hey. Glad you are still doing it and I can't wait to see. Beth that is fabulous news about the house - and it looks great! So happy to see an update! Congratulations on the house! Yay!!! Can't wait to come and visit. ;) I miss ya. Take care of yourself and yur precious bubba bump! So glad that you and the peanut are doing well. And a new house how exciting I love buying houses it's so fun. Good luck with the Masters too. I can't wait too see it again this year. Hope you are starting to feel better Beth, that morning sickness is a killer. Congratulations on your new houe, you must be so excited with eveything going on with you. I have tagged you, when you read my blog you will see what this means. Well Beth that is absolutely wonderful about the new house, I can just imagine how excited you must be, and like you said plenty of room for your growing family. I can't believe how far you are along now, soon we will be seeing photos of your little peanut. All the very best Beth.